What's more is that NBC now reports that the Turks had the Saudi consulate bugged with listening devices before the disappearance and what now appears to be gruesome murder — which suggests Turkey is currently in possession of an audio recording of the alleged killing. This might explain what some skeptics have questioned from the start: why would the Saudis send such a large murder squad to do the deed knowing they'd leave such a sizable footprint? However, it's precisely a larger team that's needed to conduct a rendition akin the CIA "extraordinary rendition" practices and series of "black sites" characteristic of the Bush "war on terror" years. This could also be the early phase of the Saudis and possibly the US crafting a narrative that leaves Riyadh less culpable — a mere "rendition" that led to "unintended" death will be an easier to manage narrative, however disastrous, yet still inviting less international condemnation and scrutiny. After all one US intelligence source told the Post after being pressed as to why the US didn't warn the journalist as he unknowingly went to his death: “Capturing him, which could have been interpreted as arresting him, would not have triggered a duty-to-warn obligation. If something in the reported intercept indicated that violence was planned, then, yes, he should have been warned,” the official said. 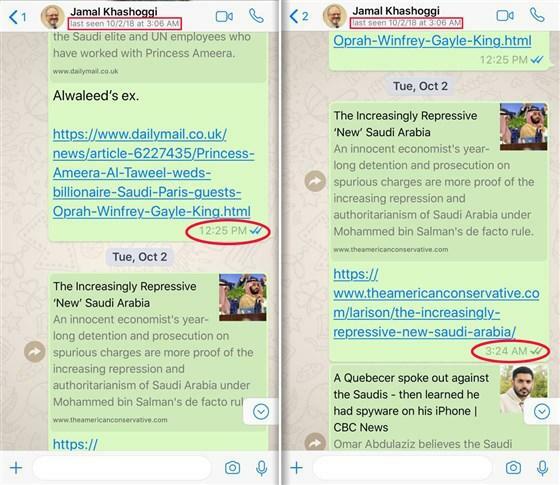 Via NBC News: Two WhatsApp screenshots obtained by NBC News from a friend of Jamal Khashoggi in the Pacific Time Zone of the U.S. show Khashoggi was "last seen" on WhatsApp at 3:06 a.m. Pacific (1:06 p.m. Istanbul). At left, a text sent by the friend on Monday, Oct. 1, 2018 to Khashoggi at 12:25 p.m. Pacific (10:25 p.m. Istanbul) was read (two blue checks). At right, a text sent by the friend on Tuesday, Oct. 2 to Khashoggi at 3:24 a.m. Pacific (1:24 p.m. Istanbul) was delivered, but was not read (two gray checks). Meanwhile, more details have seemed to emerge by the hour, with Middle East Eye reporting further information on the chronology of what happened moments after Khashoggi entered the consulate, based on the testimony of "a Turkish source with direct knowledge of the investigation". The source describes that Khashoggi was "dragged from consulate office, killed and dismembered". The source told Middle East Eye: "We know when Jamal was killed, in which room he was killed and where the body was taken to be dismembered. If the forensic team are allowed in, they know exactly where to go," he said. Khashoggi's body was then dragged into a third room and dismembered, he said. 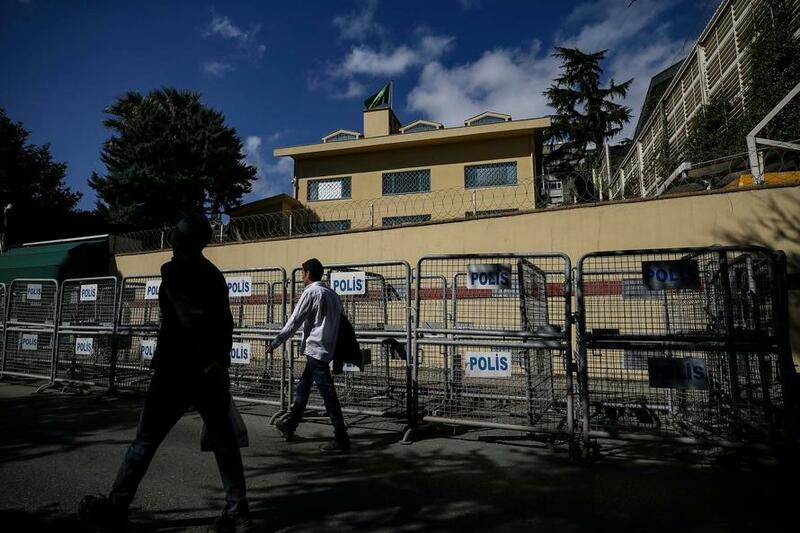 Concerning how Turkish investigators could have arrived at such level of detail concerning exactly what happened inside the consular grounds, NBC reports a new explosive detail - that the consulate was actually bugged with listening devices, according to Turkish officials. According to NBC: "On Wednesday, three people familiar with the investigation told NBC News that Turkish officials had told the U.S. that Turkey had listening devices inside the Saudi consulate, giving the Turks at least some insight into what transpired inside." NBC was further able to confirm that the disappeared Saudi journalist and Washington Post columnist had accessed his phone's text messages just prior to entering the consulate, but never after, based on exclusive screenshots obtained from his phone. If it is indeed true that Turkish intelligence had the consulate bugged, and a recording of what exactly went down exists, it is likely only a matter of time before the audio itself is leaked. Meanwhile, Bloomberg reports that Turkey and Saudi Arabia will form a joint working group to investigate the disappearance of Jamal Khashoggi. This is reportedly upon Saudi Arabia’s request — something further confirmed by Turkish President Recep Tayyip Erdogan’s spokesman Ibrahim Kalin.